- Publisher "It is possible to be a Christian without showing the mark, but if we expect non-Christians to know that we are Christians, we must show the mark. "Christians have not always presented an inviting picture to the world. Too often we have failed to show the beauty of authentic Christian love. And the world has disregarded Christianity as a result.In our era of global violence and sectarian intolerance, the church needs to hear anew the challenge of this book. 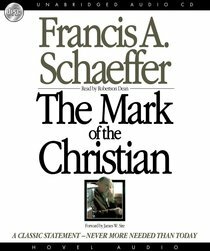 Decades ago Francis Schaeffer exhorted, "Love--and the unity it attests to--is the mark Christ gave Christians to wear before the world. Only with this mark may the world know that Christians are indeed Christians and that Jesus was sent by the Father. "More than ever, the church needs to respond compassionately to a needy world. More than ever, we need to show the Mark. - Publisher "It is possible to be a Christian without showing the mark, but if we expect non-Christians to know that we are Christians, we must show the mark." // Christians have not always presented an inviting picture to the world. Too often we have failed to show the beauty of authentic Christian love. And the world has disregarded Christianity as a result. // In our era of global violence and sectarian intolerance, the church needs to hear anew the challenge of this book. Decades ago Francis Schaeffer exhorted, "Love--and the unity it attests to--is the mark Christ gave Christians to wear before the world. Only with this mark may the world know that Christians are indeed Christians and that Jesus was sent by the Father." // More than ever, the church needs to respond compassionately to a needy world. More than ever, we need to show the Mark. About "The Mark of the Christian"
"It is possible to be a Christian without showing the mark, but if we expect non-Christians to know that we are Christians, we must show the mark. "Christians have not always presented an inviting picture to the world. Too often we have failed to show the beauty of authentic Christian love. And the world has disregarded Christianity as a result.In our era of global violence and sectarian intolerance, the church needs to hear anew the challenge of this book. Decades ago Francis Schaeffer exhorted, "Love--and the unity it attests to--is the mark Christ gave Christians to wear before the world. Only with this mark may the world know that Christians are indeed Christians and that Jesus was sent by the Father. "More than ever, the church needs to respond compassionately to a needy world. More than ever, we need to show the Mark. "It is possible to be a Christian without showing the mark, but if we expect non-Christians to know that we are Christians, we must show the mark." // Christians have not always presented an inviting picture to the world. Too often we have failed to show the beauty of authentic Christian love. And the world has disregarded Christianity as a result. // In our era of global violence and sectarian intolerance, the church needs to hear anew the challenge of this book. Decades ago Francis Schaeffer exhorted, "Love--and the unity it attests to--is the mark Christ gave Christians to wear before the world. Only with this mark may the world know that Christians are indeed Christians and that Jesus was sent by the Father." // More than ever, the church needs to respond compassionately to a needy world. More than ever, we need to show the Mark.